Last year, Envoy introduced the Career Advancement Program (CAP) to encourage non-pilot Envoy employees to reignite their passion for flight. Some employees who had already received their Commercial Pilot’s License, but for one reason or another, didn’t continue to earn the necessary hours to apply to Envoy as a First Officer. The CAP assists these individuals by providing up to $30 thousand in financial assistance to get them back into flight training full time. 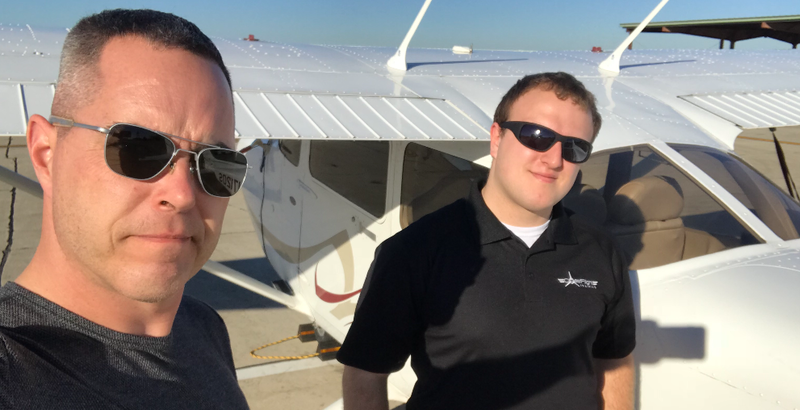 By enrolling in the CAP, employees commit to building their flight hours full-time in order to land a job as a Certified Flight Instructor (CFI) at a local flight school. One of these CAP participants is CFI Jesse Sinagra who currently instructs student pilots at Coast Flight Training in San Marcos, Texas. Coast is also one of Envoy’s partner schools for its Rotor Transition Program that helps military helicopter pilots transition to a commercial pilot career. Jesse began his Envoy career as a Station Agent at Dubuque Regional Airport (DBQ) working on the ramp, at the gate and the ticket counter honing his customer service skills. Jesse was kind enough to answer a few questions about his progression through CAP and his hopes for a future of flying for Envoy and, one day, for American Airlines. 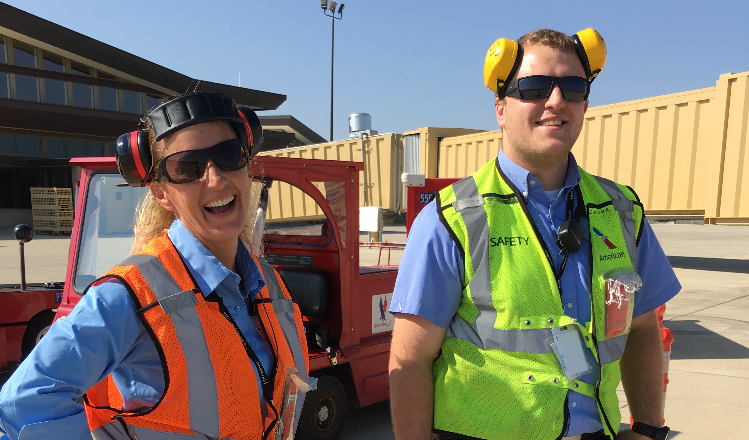 Jesse Sinagra (right) at Dubuque Regional Airport working as a station agent. Where and for how long did you work as an Envoy station agent? I worked as a station agent at Dubuque Regional Airport (DBQ) for approximately a year and a half. I worked as an agent while advancing my flight training at the University of Dubuque. What did you like best about that position? I have many fond memories working as a CSA, but what I loved most was working with the great people at my station. I was fortunate enough to have a great manager in Ryan Plumley and have developed lasting relationships with my other coworkers. We always had a great time working together and when times were tough, we knew we could count on each other. Another reason why I loved my position was being around the airplanes and the flight crews as there was always something for me to learn. I also enjoyed being able to interact with the passengers and help them with their travels. When were you bit by the ‘flying bug’? I caught the flying bug at a very early age, about six or seven years old. I was one of the lucky kids growing up in that knew exactly what I wanted to do with my life long before my peers. In fact, what really sparked my love of aviation, was when my family took a trip to Florida, and I enjoyed the flights more than I did the actual vacation. What made you decide to take advantage of the Career Advancement Program? I decided to be a part of the CAP, because it would provide me with a great opportunity to advance my flight experience and ease the transition from station agent to regional airline pilot. How has the CAP benefited your life and career goals of becoming an Envoy/American pilot? The CAP has given me the financial support I need to continue moving forward with my flight experience and has given me a “foot in the door” with Envoy. I love the idea of being able to transfer from a station agent to regional airline pilot for Envoy so easily. Jesse (right) working as a Certified Flight Instructor at Coast Flight Training. What advice would you give to other non-pilot Envoy employees about joining the CAP? My advice would be to learn as much as possible about Envoy, build a good network with other pilots, work hard in training, fly safe and have fun. This is a unique program, and I would definitely recommend it to other aviators. In a nutshell, explain your experience as a CFI at Coast Flight Training? Being a CFI at Coast Flight Training has really been a great experience for me. Instructing has taught me so much more about aviation than any other part of my training thus far. My favorite part of the job is being able to train former military helicopter pilots how to fly Cessna Skyhawks. I have a rare opportunity to instruct pilots with thousands more hours than me how to fly airplanes. I always enjoy listening to their experiences flying helicopters. How soon will you be training as an Envoy First Officer? At my current rate, I plan on beginning my First Officer training by the fall of this year, and I am very excited to do so. What are you looking forward to the most about becoming a commercial pilot? Flying commercially has always been a dream of mine. I am really looking forward to working with some of the greatest pilots in the industry and training on some of the finest jet aircraft that airlines have to offer. 04.15.19 / Celebrating Five Fantastic Years!